Natacha Chough (M.D. 2010) spent her childhood looking at the sky. There was something so inviting, so challenging about the immensity of space — and our place within it. She decided early on that she wanted to work at NASA. But, Chough says, “I knew that meant having a successful career in something else first.” Her love of science — particularly biology — nudged her to pursue medicine, and there she found a second calling. Medicine, she discovered, was a means of navigating life on Earth. At U-M, Chough excelled in emergency medicine and helped “resurrect” the Wilderness Medicine Student Interest Group. She loved working in unpredictable environments; being forced to improvise made her approach her craft more creatively and confidently. “MacGyver medicine,” she calls it. During an undergraduate internship at NASA in 2000, Chough learned about aerospace medicine, a specialty developed for the unique needs of air and space travel. The field combines two of her greatest loves: space and life sciences. “It was like a dream come true,” she says. As simple as that, her disparate ambitions fused into one career. 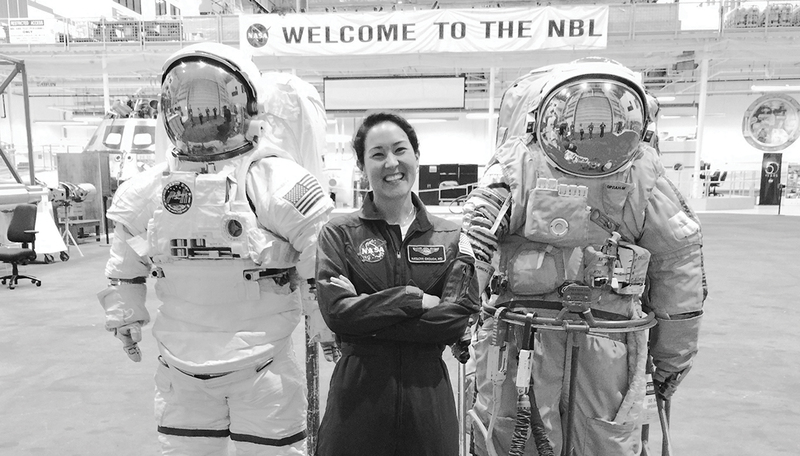 Now, as a Flight Surgeon at NASA, Chough is living that dream. Most recently, she provided ground medical support and telemedical care of Kate Rubins, Ph.D., the 60th woman to fly in space.